Just like most collectors, I have a seemingly never-ending wishlist. In my case the wishlist is made up mainly of dolls that I’d really like to shell OCs into (plus a few extras like Aileen dragons). In all honesty, the wishlist could be almost completely done if Fairyland ever decided to sponsor me, but recently I decided that a Luts Honey Delf Lolly would do nicely for one of my characters. I really like her, but of course I worry about how she would look with my Fairyland dolls especially, since those are the ones she will often be posing with – I guess that is one of the worries, when you’re a mono-company collector such as me! I do have a handful of Latis though, but they can make any picture look absolutely precious. Lolly would be the shell for my character Rikkilea, whom also happens to be the character I’m dedicating this year’s NaNoWriMo to! However she is currently a distant dream, as funds are more than limited (strangely, sitting at home and waiting to get better doesn’t yield tons of doll money), and as such I won’t be able to bring her home anytime soon, unless somebody decides to do a trade with me! So while I listed Rikkilea as one of those characters that won’t be part of my life in doll form anytime soon, Lise (from Red Riding Hood) decided to mess with my plans a little. 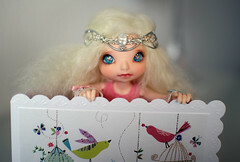 She has decided to get herself a new doll from Fairyland, and as such she will be getting a free gift. Being generous and nice as always, she decided that she wants to gift me the LittleFee gift faceplate for reasons I still don’t fathom! And while I was absolutely determined to turn her down and tell her to sell the faceplate to fund some dolly stuff for herself, I made the grievous error of going to Fairyland’s page and looking curiously at the faceplate – well, I obviously needed to know what I was turning down. And BAM, I was hooked. I rarely see the potential in a blank face, but even I could tell how absolutely stunning this face had the possibility of being. And while still being determined to turn that crazy “Santa Claus meets fairy godmother”-impersonator down, I of course peeked at my doll wish list to see if it would be able to replace any doll. Luckily, this faceplate would not be suited for any of my characters! Crisis avoided! I wondered though – this faceplate reminded me of some other faceplate. Lise and I discussed it for a while and ended up agreeing that it was probably that “Fairyland feel”, where they all feel a little alike in the best way possible – they have the Fairyland look, and they look cohesive when together. Then I later looked at the Lolly sculpt (when I find a pleasing sculpt I like to look at it a lot in the beginning), and the crisis returned with an orchestra and it’s own full-length trailer. Somehow this sculpt reminds me of the Lolly face! And while I seem to be the only one who can see it (something about the lips especially, but also the eyes), I absolutely cannot unsee it. So yes. I will be getting another floating sometime head next year, dang it. I don’t know if she will completely replace Lolly as my Rikkilea shell, I have my strong suspicions. Especially considering I’m a little afraid to purchase outside of Fairyland, as I really really love their posing, and I’ve had to sell my Momocolor doll due to her posing. Also, I’m plotting on winning the lottery and buying some expensive doll for Lise and clothes for all her dolls (and a wig for Connor) to make up for all these precious gifts. So you’d like to see a mock-up of her, you say? Alright! Luckily I’ve gotten a new, gorgeous phone for my birthday (thank you, family! ), so I have a lovely (and fun: My brother would not make a pretty sister!) program for makeup, as I don’t yet feel ready to do a full mock-up in Photoshop (although absolutely taking tips on how to do that). I’m not completely settled on the look yet, but I really like the strong lips and the bold eyeliner, as I’m hoping for her to look a little 1940’s in her makeup, but still twisted in my own way. The pink leaning lipstick has been chosen over the traditional red due to me wanting her wig to be lilac/lavender. I’m wondering if it’ll feel too boring in the long run, or if her accessories will make a more “interesting” faceup a little too much. Do you do mock-ups of dolls you’d like to own? Would your brother look lovely with blue eyelashes and strong, pink lipgloss? What do you do when you can’t decide between several sculpts for a character?